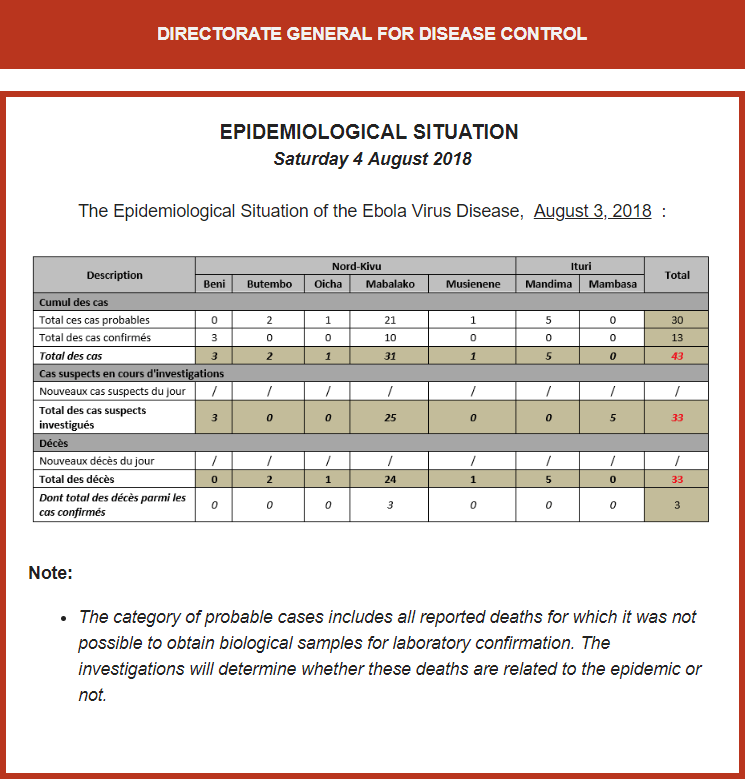 In spectacularly rapid fashion, the Democratic Republic of the Congo’s Ministry of Health (MOH) has started it’s daily, very detailed, Ebola virus disease updates to cover the case details and additional information, about the new northeastern EVD outbreak. Where is the hot zone this time around? Figure 1. 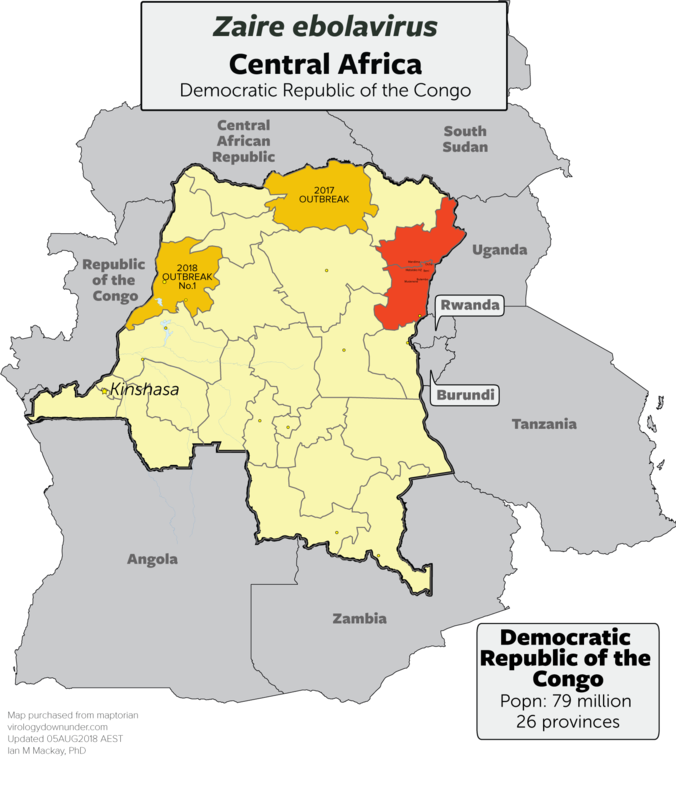 A map of the DRC highlighting the past 3 EVD outbreak, with the most recent in dark orange. Click on image to enlarge. I love me a map. Unfortunately, it’s really hard to find editable ones for this and the last DRC EVD outbreaks. We talked about map issues during the last outbreak in Zooming in on the latest Ebola virus disease (EVD) hotzone. There are great maps over at reliefweb added by the Mecdicins sans Frontieres map unit. Sadly the most up-to-date ones don’t seem to be layered and editable. There is an editable version from MSF as part of a kit here. For communications and blogs, I like to try and use simplistic maps – but theirs are the most accurate around. So we have those to look at. 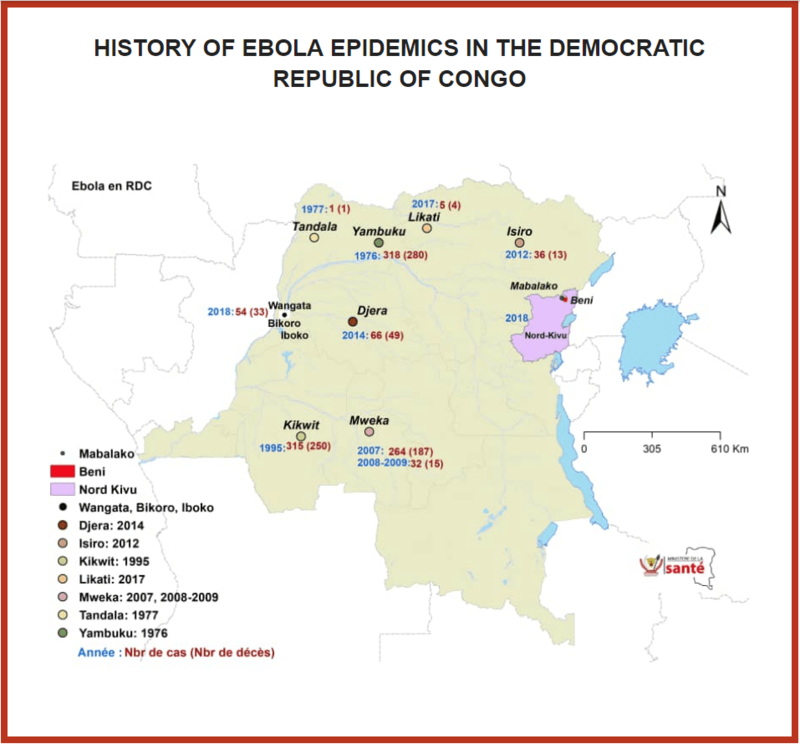 The DRC MOH also includes a series of maps (Figure 2), as does the WHO Disease Outbreak News (DON; Figure 3). The WHO map is worth saving and opening it in photo viewer to get some more detail from it. Figure 2. One of two maps from the daily DRC MOH EVD update. Click on image to enlarge. Figure 3. The map from the WHO DON EVD update. Click on image to enlarge. 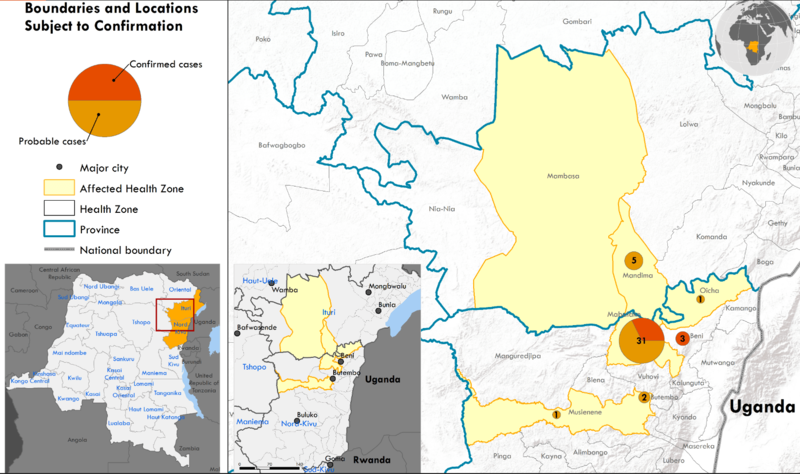 The map I’ve cobbled together (Figure 1) shows the last 3 outbreaks in the DRC with the most recent marked in dark orange. It currently spans two Provinces (North Kivu and Ituri) and encompasses 6 health zones. We now know that the virus causing this outbreak is highly likely to be Ebola virus (EBOV), of the species Zaire ebolavirus and not one of the other species. This is good news for the vaccine, some stocks of which remain in the DRC from the previous outbreak, along with some experimental treatments. What do the latest official numbers tell us? Figure 4. Data from the DRC MOH which can be viewed at this site. Click on image to enlarge. The new update includes the suspected cases in a separate section (Figure 4). As we saw clearly in the last DRC outbreak – and every other one – suspect cases can go up and down a lot until outbreaks are controlled. I have no problem with that. It’s usually informative for different reasons. It’s the trend that often matters most as an indication of control, or loss of it. But trends can take patience. In this new report, suspected cases do not contribute to the total case tally. The DRC MOH confirmed this on Twitter that the suspected cases will not be added to the grand total of cases, but kept as a separate line, to avoid confusion due to the total rising and falling due to big changes in the suspect case numbers. Hi Ian, no we deliberately kept the suspect cases out of the total number this time. It’s to avoid to have the total number changing every day, sometimes going up or down with suspect cases being invalidated. Last time, it created too much confusion. The tally includes 33 deaths which calculates the crude ‘proportion of fatal cases (PFC)” to be 43%. It’s really early days yet with much data to collect and many cases to watch, contacts to find and uninfected people to strike off lists, but this is how things sit for the moment. Great content, I learn new information from your post, Thanks for sharing.